Discussion in 'Pokémon Animé Discussion' started by Ignition, Aug 14, 2018. I think it's only fitting we get this since we had a "Rate the PokéGirls" thread. IMO, I generally care about the male companions much more than the females. I can't really say why though I think Brock has a lot to do with it. Kiawe is my favorite character in SM (besides Ash) and my favorite traveling companion to date. He matches my personality: competitive, passionate, caring, and driven to improve constantly. I like his team: two opposites that clash with each other and their trainer well. His focus episodes show how much he cares for not only his Pokémon but his family. Even when he's not the focus, he has small moments where I can't help but smile (the latest UG episode comes to mind). He's the perfect balance of a friendly rival for Ash: he's not degrading him but not buttering him up with every encounter. 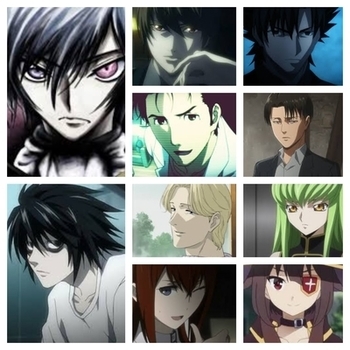 If I had no knowledge on this series, I would think they're brothers. Sophocles is the most funniest thing to happen in SM. I love how he's cocky but also insecure. He doesn't mean harm his friends intentionally and he just wants to have fun while learning. Togedemaru's voice since day 1 has made me laugh and its quirky nature is too cute to hate. Charjabug is weirdly bland to the point in which I love it. It's always helping Soph and Togedemaru without being in your face about it. He feels like the little brother who tries to outsmart you to try to look cool. I had hopes for Clemont since I saw his first appearance in XY. He was the good mixture of mature and inexperienced. His dynamic with Bonnie, while overplayed by the end of the series, reminded me of May and Max (that's a good thing). His team was good, but I really wish Chespin evolved and for Heliolisk to travel after their gym battle. Luxray, although quite bland personality wise, always excited me whenever he showed up. Bunnelby's role of straightman was great and his battling recorded was decent. He felt like Ash's best bro during the middle of XY. He had left an impression on me after their gym battle. Brock: the first and oldest traveling companion. He was mostly the group's older brother but his antics with his flirtatious nature was always a nice twist on that. His team was one of the most interesting (especially in Johto and AG) as it was nice to see him deviate from his specialist typing. His dream to become a Breeder never clicked with me tbh because there was never enough focus on it. He truly felt like Ash's best friend as they rarely had conflicts and Ash always knew he could rely on Brock. His gag really felt flat post Johto and he slowly drifted into irrelevancy. Cilan was a mixed bag. I love the "I'm a _________ Connoisseur" gag plus his variety of Pokémon. However, the "It's Evaluation Time" gag really annoyed me. I like his character as he was passionate while being classy. He never had a noticeable bond with Ash outside of "We're friends 4ever!" tbh. His dream, like Brock's, had little focus so I never cared for it. Tracey is literally only here because, while he's ok, he has little personality and is more tolerable than Max. His only plus is his Scyther. Max. He has no team to discuss about. His personality was the typical "snobby and emotional 6 year old". His bond with Ash was decent but I hated how he ragged on him in their first meeting. What really makes me dislike him is his whole fallout after Ash beat Norman. I somewhat understand his reasoning but the kid had to have known it was likely to happen. Plus, it solved nothing in the long run. I wish his brattiness was cut short early on. My rating is about the same (I might rate Max higher than Tracey though, I dunno, there was SOME times he was obnoxious to the point of being funny, especially with his dub voice, plus he at least got his comeuppance sometimes, like Torchic flaming him). I notice that the three highest have one major plus, they have at least two Pokemon that really bounce off of each other and their trainer rather well, which helps add an extra dimension to them. This whole parent and two siblings dynamic between them all (though it's a shame when there's a third Pokemon that gets underused within it). Kiawe is arguably the best utilised male companion, in that he feels like a major presence in the show without needing to use anymore spotlight. In fact he's only had THREE proper center stage episodes, and while they're all good, he can work just as well in supporting roles due to a mix of good battling skills, mentoring/exposition and comic relief, as well as being an awesome foil/friendly rival for Ash. Turtonator and Marowak work well off of him and each other and I love seeing Pokemon other than conventional 'cute' protagonist ones being show stealers. Charizard is mostly just a prop, though given he is a ride Pokemon I'll let it pass. Sophocles is near completely stagnant as a trainer, but I like how we learn a little extra about him nearly every episode he has, and his Pokemon in spite of their limitations still manage to feel more likeable and useful than some of the more dynamic Pokemon like Popplio and Tsareena. He's also perhaps one of the better uses of a non-battler trainer since he mostly sticks to that and taking part in more diverse manners rather than just doing lamer battles all the time like the girls, even if he is sorely lacking much agenda focus or even a really developed goal. He feels a bit superfluous with Lillie around, but since they both work off of Ash well I find it hard to begrudge him being around. Clemont was fairly good for the first half of XY, good mix of comedy and competence (both in conventional battling and less conventional tech and brains) sadly he dwindled in favour of Serena in the last half besides the odd episode, which is a shame, I see no reason Serena couldn't have had the showcases while he kept more of the fillers, which he tended to make better use of. His special was also pretty fun, showing he didn't need Team Rocket or Ash for padding. 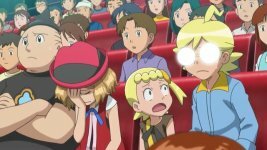 On a side note, I kinda appreciate the chemistry between the latter two (and Lillie from the Pokegirls) and Ash, if partially for fondness for friendly 'jock and nerd' chemistries. I like how Ash, despite not being studious and conventionally intelligent, seems to have a strong respect and curiosity for abilities and smarts over just battling and power, even when he doesn't quite get them, it shows an extra more open minded depth to him. This made the first few episodes of XY particularly charming, since despite Ash being at his tops and Clemont feeling kinda overwhelmed by how courageous he was, he still seemed to impress and be helpful to Ash with his own niches without Ash ever needing to be humbled or guilted into it first. Shame it slowly got reduced to that damn catchphrase afterwards though. Brock is the undisputed no. 1, and not just in male companions, but overall. His comedic timing was hilarious, and beyond that, he was Ash's best friend, always looking out for him. It might come off as a surprise, but I'm a huge fan of Clemont. Loved his experimental failures (especially in the first half), and he also got some good development, especially XY009, which is a very good episode. Also, his gym battle is hands down the best between Ash and a traveling gym leader. He fell off a bit in the second half, but still did play crucial roles in helping Ash and Greninja, and in the TF arc. I also liked his team, especially Bunnelby, though Chespin could get pretty irritating. Luxray sadly didn't get much spotlight outside battles, though I did appreciate whenever it would show up (honestly felt that after the gym battle, Clemont should've replaced Luxray with Heliolisk). Kiawe is my favourite character in SM. Good combination of comic moments as well being very passionate and competitive. He's also the only character who's parents feel fairly well shown. However, I do think his 'passionate' moments that tend to play off as comedy sometimes feel a bit exaggerated, but overall, a very good character. Cilan was probably the only decent part of BW. His evaluation times were a hit or miss, since some were really funny, but some just felt meh. His goal was really poor though, and I didn't feel invested in it at all. Pokemon wise as well, was mixed, since I didn't like Pansage too much, though Stunfisk was alright. Tracey is pretty forgettable, since he only had one season, but while not doing anything noteworthy, he didn't bug me either. I did like his Scyhter as well. And tied for trash are Max and Sophocles. I just couldn't stand Max's snarky and know it all attitude, and moments that tried to focus on him just fell short. Sophocles's episodes (SM006, SM026, SM041, SM069) all rank as some of the worst SM episodes I've seen. He offers nothing. Togedemaru's hyperactiveness is also mixed, since while it can be cute at times, it's also pretty annoying as well. 345ash-greninja and Genaller like this. I'm curious: is it Sophocles's personality, the episodes themselves, or a mixture of the 2 that makes you dislike them? Brock would probably have be first but because of ADV and DP he's a shell of the great character he once was. Brock is the overall best, it's not even close! Cilan's third. I hated his guts originally as I was pissed about Brock leaving but Cilan quickly changed that with his loveable personality and quirk for being a connoisseur of literally everything under the sun! Sadly he pretty much got dumped development wise once Dwebble evolved, and they never fully fleshed out his goal. It would have been interesting to see a male companion with an actual goal that we see progress being made. Sophocles, basically Clemont but better. He's actually a fun character unlike Clemont and his Pokemon are actually interesting too. His goal is terrible though. Wants to go to space..... well better start pursuing a romance with Lillie pal, cause only rich people can go to space! Clemont, boring. Luxray was wasted on him. Brock has to be the number 1 here. He played a huge role at shaping up Ash's character and despite his staleness during AG and DP, he was always fun to be around especially during OS where he was funnier. Never really cared all that much about his Pokemon though Happiny was hilarious lifting stuff. Kiawe would be second. He is hilarious during his passionate moments while he is a fairly competent trainer plus he is the first companion who gets the chance to participate in a league. His team is also pretty nice with Turtonator and Marowak having opposite personalities but they still make a pretty good team. Sophocles comes third. He is fun to be around and his Togedemaru has proved to be quite useful at times even if she sometimes causes trouble herself and Charjabug has also contributed in its own way at times albeit bland but it's just a cocooned bug so I can accept that. His episodes were quite interesting too, well apart from SM006. Also, I'm glad he didn't get an explosive machine gag. Cilan comes next. Evaluation time could be better but wasn't entirely bad either. The problem was that he felt that he was an already established character who had nearly accomplished his own goal and seemed to be perfect at everything he did. I liked his interactions with Ash and Iris and he had various funny moments as well. I was never fan of Pansage and the Unovan monkeys in general but Stunfisk and Crustle were fine. Clemont is in fifth place. I liked that he was gain more confidence and all. His gym battle with Ash was the highlight of his character but at the same time it ended up being his downfall since after that he was just boring and barely had anything going for him till Flare arc kicked in. I only liked his Bunnelby. I was apathetic towards Luxray, his Chespin was just downright annoying being a worse Oshawott and Dedenne is by far the most annoying and useless Pikaclone. Tracey comes sixth. He didn't stay around for too long but I actually liked and cared about him because I always liked seeing good artists being around. He should have had a cameo appearance at least in the Kanto arc. Regarding Pokemon, I only liked his Scyther though I did like the way he utilized his Pokemon as a Pokemon Watcher. Max is dead last by a landslide. He was annoying most of the time but I have to give him that his relationship with his sister felt natural. Oh and he was the only person who has mentioned seeing Ash in a regional league but that's just it. I really don't see the point of having kids younger than 10 years old in this show since they are just a hydrance. In fairness this is a show where actually travelling into space has happened more than once. Then again it's also a show that's made several decent stories about cooking agendas with Pokemon so that doesn't mean anything. Pewter Gym Leader > Stration Gym Leader > Lumiose Gym Leader > Anime-original sketchbook guy > A Trial Captain who is reduced to a gag classmate > Sopho-clips? > Anime-original know-it-all brat. Despite him being in the background in AG and DP, I still enjoyed Brock overall as a character and the fact that his story got concluded sealed him as my favorite male companion to date. Kiawe is just amazing with his humorous moments while being a great battler imo. Especially in the Detective Rotom and Stakataka episodes. Cilan was pretty stagnant in his goal and his evaluation time would sometimes be a tad annoying in terms of hampering momentum in a battle but I liked everything else about him. His personality and Pokémon were all fun to warm throughout BW imo. Clemont, to me, was actually pretty enjoyable until the Lumiose gym battle and then just ended up being forgettable. Didn’t help that his gag was very unfunny and his Pokemon were pretty bland (Bunnelby was a bit better later on tho) imo. Sophocles on the other hand does have Pokémon I really enjoy although I wish he had a better first impression in the beginning like Kiawe and Mallow. It took until the Charjabug racing episode to make me start caring for him (which btw was pretty fun to watch). Brock was a traveling companion for all of Kanto, Johto, Hoenn(which for simply sake includes the Kanto Battle Frontier), and Sinnoh. While Max go all of Hoenn(which for simply sake includes the Kanto Battle Frontier), and Cilan got all of Unova+ the Decolore Islands and Clemont got all of Kalos, while Kiawe and Sophocles are getting almost all of Alola to appear, so all of them got plenty of episodes to appear in and had a good amount of time to developed regardless if they did get a lot of development or not however if you look at Tracey he got the Orange Islands however the problem with this is since the Orange Islands wasn't that big of a series or an arc being only about 35 episodes long with Tracey only appearing in about 33 episodes, which is nothing compared to the amount of time the other Male Companions got. I feel like Tracey would have really benefited going to Johto with Ash, Misty, and Brock(if it was going to be a situation where Brock was going to return regardless) as that would have meant Tracey would have had a bit more time to developed or show off a bit more heck and if they really didn't want to have Ash have 3 traveling companions with him going to Johto they could have just had it been Ash, Misty, and Tracey traveling through Johto and then at the end of Johto when Ash is going to Hoenn they could have Tracey then choose to become Professor Oak's assistant and then still have Brock reunite with Ash and travel through Hoenn with him. Lmao at Sophocles being better than Clemont, he’s basically a worse version of Clemont. Kiawe is better, but Sophy? LilligantLewis, 345ash-greninja and Twilight-Kun like this. I disagree, Clemont was boring, especially in the dub; Sophocles at least has a more entertaining personality. He's Clemont done right imo. ash&charizardfan and Ignition like this. Dragalge, ash&charizardfan and TheWanderingMist like this. Kuzehiko and ash&charizardfan like this. Sophocles is shown to be much more efficient at making inventions, has a battle style that's more that's just "Luxray, use Swift!" & has more of a personality than the typical unfit nerd. I like Clemont, however. ash&charizardfan and keepitsimple like this. He's not more efficient, seeing as that would mean he makes more in a shorter timeframe, he's just more cautious when creating them. Plus, Sophocles inventions tend toward analysis-type devices while Clemont's were often practical, and in some cases unbelievable (see "the actual video of memory" machine). Or perhaps Sophocles' inventions would fail just as quickly if he had to make them in the timeframe Clemont did. Cilan imo was very enjoyable especially his funny moment and I think ash, cilan and iris as atrio was also very enjoyable. His only issue was he was too good and perfect as a companion in a show where being too good is a bad thing. Kiawe is fantastic as well but I get a feeling he was much better at the start of the series and he has kindof tonned down in seriousness as the series progresses. I think the guy needs a big win and his big loss to brock has hurt his character. As for soph he may not have gotten focus but at least his inventions didn't exploded as a gag. And tracey is basically poor man's brock. He doesn't really battle at all (hell he's the one non-battler so far that doesn't get loads of 'scout point' curbstomps) and I feel like the show could do more with Sophocles' inventing side of things, we seldom see it. I think it's the fact that the large majority of Sophocles' involvement is character driven, unlike Clemont who was a main character when the classic formula was still a strong part of the show. Almost none of Sophocles' episodes follow the old formula and so just let him do his own thing, which I think helps him seem more remarkable despite arguably having less resources, while Clemont only got so many episodes where he wasn't against Team Rocket or dealing with a COTD like previous companions. This is probably also a major factor in why Kiawe sticks out so well too.